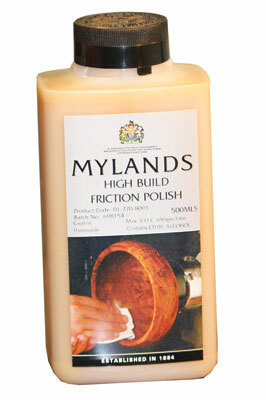 This friction polish from Mylands is available in 500ml, 1l, and 5l containers. The safety and usage instructions were clear and concise. 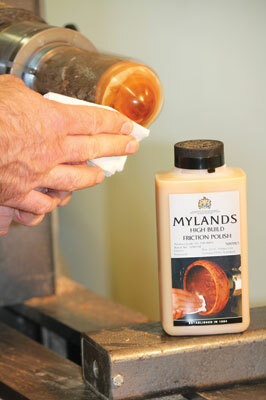 The instructions suggest sealing the wood first with sanding sealer and applying the friction polish with the lathe turning. I didn't quite follow the instructions - I applied the polish on to bare wood - yew (Taxus baccata) - with the lathe stationary and then buffed with the same safety cloth, using the polish impregnated part of the cloth first and then finishing with a dry area of safety cloth. There was no dragging while the polish was being buffed and the shine was immediately apparent. The surface felt silky smooth, too. The instructions supplied with the friction polish also recommend a final finish with some wax polish but I didn't think the surface needed any further enhancement. As a final test, I did it by the book on another piece of yew â€“ using sanding sealer, friction polish applied with the lathe moving and finally, wax polish. The finish was superb.